It is amusing, is it not, that there appears to have been a 180 degrees emotional reaction to the recent spate of defections going on in the Nigerian political space? It began with the defection of a swathe of National Assembly members from the ruling APC to the PDP. The emotional out pouring then was that at last the APC administration of President Muhammadu Buhari (PMB) is finished! Then the governor of Benue State defected; and on and on went further comments and analysis along the same line. Every counter argument that these defectors were looking for a platform to contest the next elections since they are most unlikely to find comfort in their current party was met with derision and cat calls. No! It shows his former allies became the ‘tyranny’ of this President, they screeched! Then the defection of the Senate president, Bukola Saraki, and the governors of Kwara and Sokoto state. The racket retched up! Now, of a truth PMB cannot surely win Re-election (A wi wi wi fun ko gbo. Ko wa tan ni di alaseju?! But we warned him, now see, he is exposed!) Saraki is a master strategist, they sang! He has knocked down the final nail in PMB’s loss, they chorused! Even the PDP got on this emotional bandwagon. It went to town with how this is a confirmation that the ruling party had squandered its political capital! They were returning to power, bla bla bla. It is as if the gates of hades were unlocked! Now, it is that PMB’s toured anti-corruption drive is a ruse; that it is quite clear Akpabio is being blackmailed (How I hate that word! Why not ‘whitemailed’? 🤔). How can a sensible person move in the opposite direction? Bla, bla, bla! Now the PDP warns the APC to stop poaching its members! There are also rumours of impending avalanche of defections from PDP in a part of the country that had been the bastion of opposition to PMB – South East. And there is abundant panicking in the once rejoicing horde! The scratching of heads have made many heads sore! What could be going on? Rumours also have it that some who had earlier defected are now ‘regretting and recanting’? Well, let me tell you what many have lost sight of – many who profess to understand politics and the game of it, and who freely tout same in absolutes, really need tutorials on this art; a sine qua non for holding political power. One small tip: the more adept ‘smoke’ out the less adept to show his hands; then swoop in to check mate! Politics in Africa is often said to be a game of images and nuances. Meaning it’s all about public relations more than substance (what we call EFIZI) in Nigeria. No matter how much serious policy wonks disagree with this, unfortunately we see it manifest everywhere, everyday! 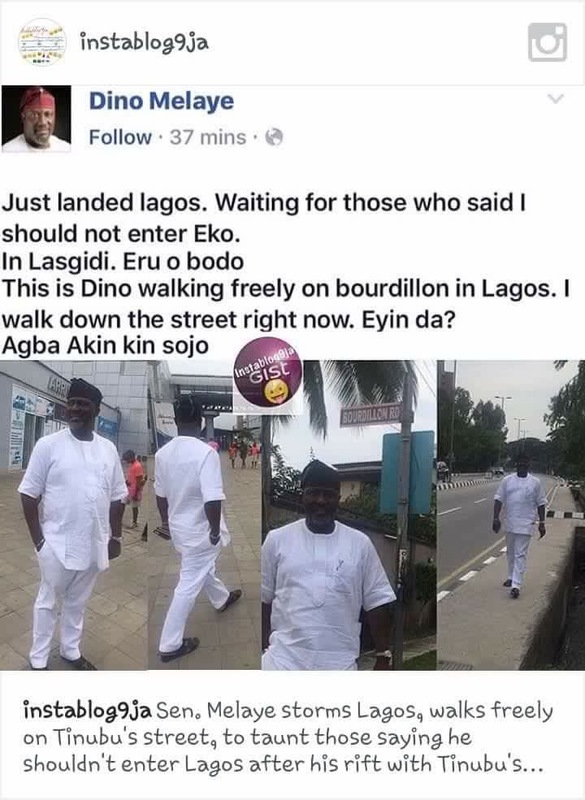 But this particular legislooter, this sinator (Nigerianese for thieving senators) takes it to uncommon realms – from his absurd dressing to his garulous vituperations! But now he has topped himself (as if that were even possible) in ridiculous behavior with these photographs splashed on social media. Anyway, could anyone who has access to this sinator remind him of one Yoruba adage: the child that abuses the Iroko tree and looks back should know that the Iroko tree takes its time to exact revenge! In other words, revenge is best served cold! I have a feeling he just messed with the wrong goon, and by this very act sang his own nunc demitis! I may very well be wrong. Only time will tell, wouldn’t it?